The grinding has paid off! We’re in the playoffs, and that’s a big load off our shoulders. This morning’s game against the U.S. was a tough one; John’s team played very well, but we were able to make some big shots at the end for the win. I think that’s the biggest thing, and that’s what we need to take out of this — that we’re finding ways to win. We’ve been in a lot of tough battles, and in all honesty, that’s the biggest positive to take out of this game, that we’ve pulled out a lot of close wins in a row now, a lot of character wins as we like to say. I think that serves us well. I think we’re definitely battle-tested and battle-ready, and that’s the biggest positive out of this streak. 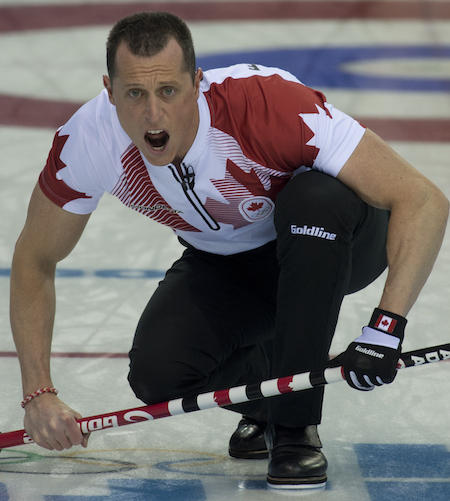 Team Canada second E.J. 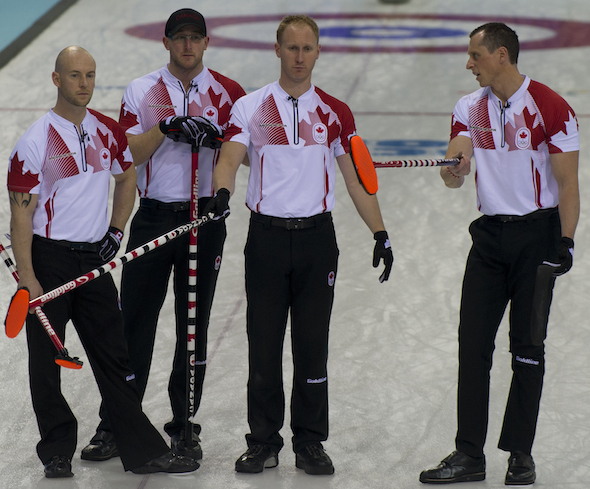 Harnden calls instructions to sweepers on Sunday. I think that’s where the chemistry we have serves us well, in these types of situations. I mean, we’re passionate guys, we’re going to show our emotions when we miss a shot that we probably should have made or miss a shot that could have broken a game open, like what happened in the eighth end when Brad had a shot for four and we wrecked. But at the same time, we know that we’re never going to give up and that everybody is giving their 100 per cent out there. That’s where the closeness our team has comes in handy. We had to let it go, and I know the first thing that popped into my mind was, OK, let’s just get a deuce, force them to one, and then win in the extra. We’re at the point now where it’s, OK, whatever it takes. Whatever it takes. Keep grinding, keep sticking with it. We know what our capabilities are. We know if we bring those into every game, we’ll be in a good position. Brad made two beauties in nine and two more great shots in the 10th, and that’s not just a testament to the team but to Brad as a skip, and being able to let that miss in the eighth go and just coming back and making his last four shots and literally winning us the game. We had a great Saturday with the NHL guys. It was cool to see them at our game, and I’ve been impressed with how down to earth they are. Those guys are big deals and they play at a very high level, and it was cool to see them come out and support our team, and we’ll be doing the same for them and every other Canadian athlete. 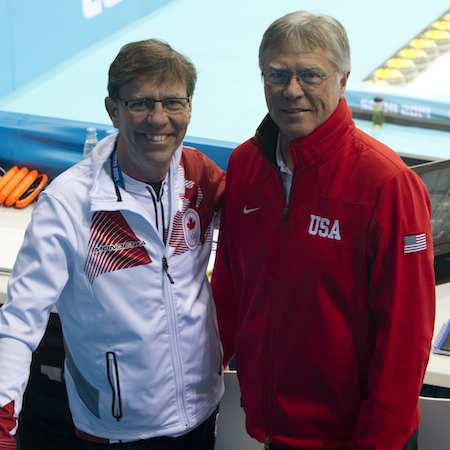 Former world championship teammates Rick Lang (Canadian national men’s team coach), left, and Al Hackner (U.S. national men’s team coach) went head to head on Sunday. We went into the athletes lounge last night, me, the two Ryans and Caleb to play some doubles ping pong, and then Sid and Shea Weber stepped in, so we challenged them. I can confirm that Shea’s ping pong overhand is just as hard as his slapshot, and Sid’s got the same touch on the ping pong table as he does on the ice. They killed us five straight. But both are great guys. They introduced themselves, and honestly, it was just the boys having some fun, having some laughs, and just getting away from the Olympic Games and enjoying ourselves. We’re back on the ice tonight to finish the round robin against a really good Chinese team coached by our buddy Marcel Rocque. We want to finish with a win! Watch the game at 10 a.m. Eastern on TSN2.